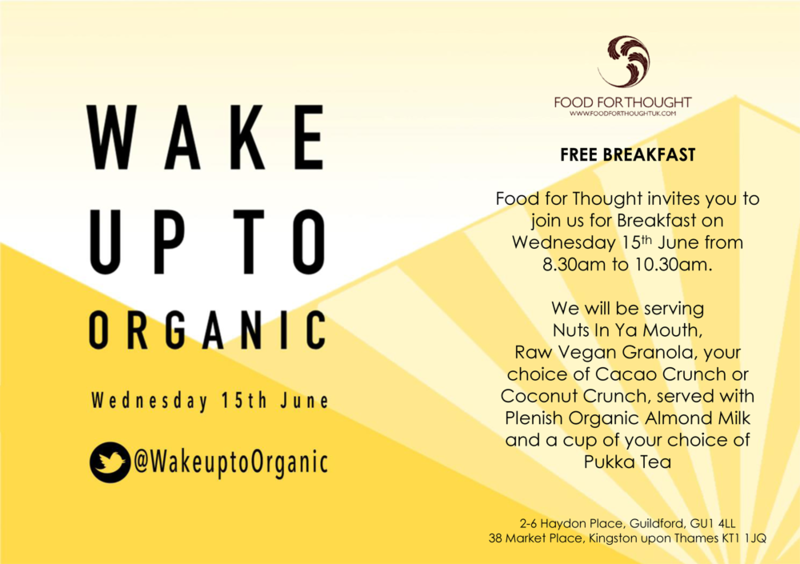 We cordially invite you to Wake Up To Organic and join us on Wednesday the 15th June for an organic breakfast. We will be serving a raw vegan organic paleo granola from ‘Nuts In Ya Mouth, your choice of Cacao crunch or Coconut crunch, Organic Almond Milk from Plenish and a cup of Pukka tea! Food For Thought, along with many other businesses in the UK will be participating in the ‘Wake Up To Organic’ Campaign organised and run by The Organic Trade Board. The OTB has one mission: to grow organic sales in the UK. They do this by communicating the benefits of organic directly with consumers via their organic promotion campaign. They also work with their members, the press, government and other bodies to help increase organic sales. This year, stores up and down the country will be offering Organic Breakfasts in all shapes and forms, from traditional cooked breakfasts, to continental style and through to staples such as porridge and, as in the case of Food For Thought, a more unusual raw vegan breakfast, catering for the ever increasing number of people who identify as vegan in the UK. With the referendum on the EU only a matter of weeks away one of the successes of being a part of Europe is little talked about. The OTB successfully campaigned and raised £700,000 to raise awareness within the UK about the benefits of organic food and drink and to drive sales. This was matched by EU funding, giving the OTB £1.4 Million to spend promoting organics over the period 2013 – 2016. Applications have been submitted for the next round of funding, 2017 – 2020. There is one massive difference with this time round; The EU will quadruple the funding raised by the OTB. To put it simply if they raise the same £700,000 as they did in 2013, this will be turned into a whopping £2.8 MILLION to spend promoting organics in the UK. This is one of the glowing success stories made possible by our membership of the EU. Often in the heat of campaigning, positive stories such as these never get reported. And more often than not it is the feel good factor of winning that helps us move forward and strive for better. So please join us on Wednesday the 15th of June and enjoy a breakfast on Food For Thought!